United Way of Central Alabama, Inc. – Helping people and the Central Alabama community since 1923. Give to help more children learn how to ride safely. 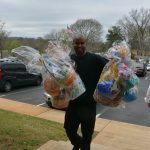 2,500 Easter baskets are needed for children and seniors in our area. Make Your Tax Appointment Now! CALL 2-1-1 to reserve your time now for United Way Free Tax preparation. Or click below for details on the program. Your financial contributions help us ensure every child has a quality education, every family has a stable income, a healthier community and access to services in times of crisis. Give today! We're improving education, financial stability and health for individuals and communities. Every day our volunteers, donors and people like you LIVE UNITED by being champions for our work. All it takes is ONE hour, ONE day, ONE month to make a lasting difference in the lives of others. But we don't do it alone. Join us today. Change doesn’t happen without you. We fight for a positive, community impact by improving lives of others through quality education, financial stability, better health, and access to services.